UNCG today announced two new co-admission agreements with Guilford Technical Community College (GTCC) and Alamance Community College (ACC) to facilitate degree completion and bolster student success by improving access to undergraduate and graduate educational resources, university facilities and support systems. 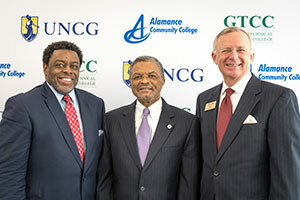 UNCG Chancellor Franklin D. Gilliam, Jr., ACC President Algie Gatewood and GTCC President Randy Parker announced the new co-admission programs at a press conference on UNCG’s campus on Aug. 2. Second, the ACC “Spartan Passage” partnership, which offers an accelerated master’s program in six different disciplines as well as a comprehensive undergraduate program. Application for the “G²” and “Spartan Passage” programs have been streamlined to benefit students. Prospective students complete one application, with a waived application fee for UNCG. 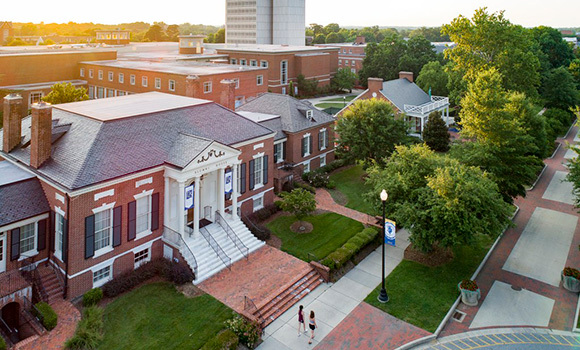 Admitted students will have access to campus facilities, events, activities and services, including the UNCG University Library (in-house and online), the new Leonard J. Kaplan Center for Wellness, academic advising and financial aid, among other benefits. The need for these programs is clear. According to research from the Community College Research Center at Columbia University’s Teachers College, and the Aspen Institute, approximately 80 percent of incoming community college students begin with the goal of eventually earning a four-year degree. Yet just 14 percent do so within six years. For more information about the new co-admission programs, visit: admissions.uncg.edu/apply-coadmissions-programs.php.